Reaching northern Vietnam is great, but what about the journey you’ve taken to get there? How about riding a motorbike? Your destination will be made all the more rewarding when you do it yourself. Grab the handlebars and hit the highway. Onward to Sapa! 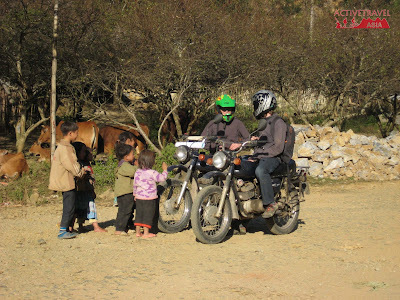 When considering a tour around Vietnam, think motorbike. Swerving routes and hilly terrain offer an exhilarating trip. With a selection of destinations ranging in both distance and difficulty, you need only rent a bike and hit the road. 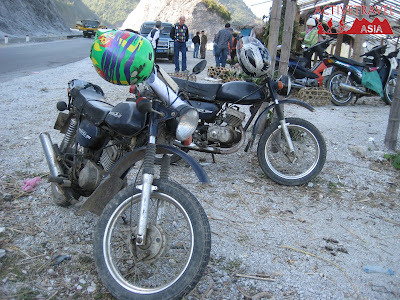 One of the more challenging routes around northern Vietnam is also the area’s most popular. From the capital city of Hanoi, take to the road and make your way directly to Sapa. Getting from Hanoi to Sapa should take about 10 hours. The deceptively long ride will include a series of small highways, winding roads, and sharp turns. Though the route seems fairly direct, an unprepared rider may well get lost only a short distance into his/her journey. Whether you need to print out instructions, bring along a map, or learn to read Vietnamese road signs, you should prep yourself before making the trip. The Northwest Loop can vary from one to three weeks depending on how much distance is covered each day. Along the way, highlights will include the agricultural district of Mai Chau, the hot springs at Dien Bien Phu, and the rural region of Lai Chau. The trip will reach its apex in Sapa where most riders may decide to spend a couple of days resting. The way back will probably be more direct as it’s assumed that fatigue will be starting to set in. 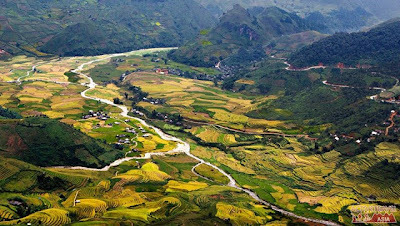 Once it’s been decided that you’ll be making the trip up towards Sapa, you need only decide whether to go at it unaided or with a preplanned itinerary. As a solo biker you will have the advantage of making your own decisions. You’ll be able to go at your own pace and you’ll be left to your own devices. You’ll also be responsible for finding accommodation in small towns and villages. For those who aren’t interested in riding with a group but would like some guidance along the way, there is the interesting option of a preplanned itinerary. This plan involves arranged accommodations, occasional meals, and guided tours at notable sites along the way. On a six-day excursion look to pay around $600 per person for this service. As you’ll be on a motorbike, it’s best to avoid any potential rains. The wet season is at its worst in July and August. If you aren’t comfortable riding in the cold, it’ll be best to avoid December through February. Prime biking months run from September to November and March to May. Weather during prime biking months will range anywhere from 59°F (15°C) to 77°F (25°C). Keep in mind that the weather changes quickly in Vietnam’s northern region and though the day may start out warm, it can quickly get nasty. To get to Hanoi, fly into the Noi Bai International Airport which services a number of international airlines. Bring along a GPS if you’re going at it alone. Plan stops ahead of time. Choose to bike in a season with a favorable climate. Plan on spending over $60/day. Rush yourself if you’re a novice rider. Leave Hanoi without a tire-repair kit. Vietnam has a total of seven UNESCO World Heritage Sites. The nation has an impressive unemployment rate of under 5%. The Vietnamese equivalent of ‘Thank You’ is ‘Cam On’, pronounced gum-un.